As Orthodox Browningites, we set off to the range with a bunch of guns, most importantly my M1900 and M1911A1. Julia shooting the M1900, and on the right the best I could do, six shots at 10m standing. 42 shots at 10m standing. Yea, I should be able to do better. This gentleman was shooting his Colt 1903 Pocket Hammerless. 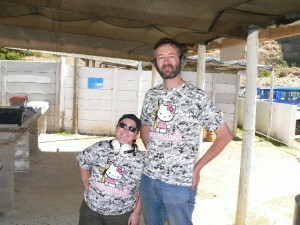 Kalashnikitty T-shirts from Eric via Kevin’s blog. New shooter, going to the range with me? Read this. Paul Simer (“a young, married geek in West TN”) wrote the following, back in June 2007. It featured in my links, but then his site disappeared. I don’t know what happened to him, the last post I can find on forums and the like is a comment on Breda’s blog dated May 15th 2009. I finally managed to dredge a copy of his guide out of the Wayback Machine. I’ve taken so many folks shooting for the first time that I decided to create a page with all the information I wanted you to have before you hit the range. First is instruction on how to ensure safety while we’re there, then there are some specific rules concerning shooting as my guest at my particular shooting range. 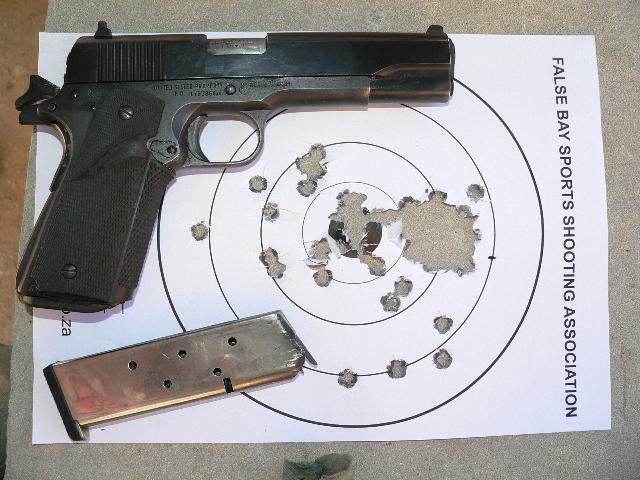 Finally I give you some pointers on what you can do to make your range trip more pleasant. If you’re not a mechanic and weren’t raised from childhood maintaining old cars, the internal workings of an automobile are a mystical, mysterious topic. If you hear a strange noise or smell a strange smell while driving, you’re terrified. Images start running through your head of hefty mechanic bills, or getting stranded when your vehicle falls apart. If you take the time to get familiar with your vehicle, learn to change the fluids and belts, maybe even purchase a manual, a mechanical problem with your car becomes much less frightening. If you’re not a computer whiz, and rely on others to fix the problems with your computer when it breaks, then error messages and crashes are frustrating, even more so because you don’t know what’s causing them or how to fix them. When your computer starts making weird noises or rebooting randomly, you feel gripped by terror, deathly afraid that you’ve done something wrong. You never even think about opening the case to install an upgrade, because you have no idea what anything in there is. If you spent some time on Google researching your problem, you might find that the fix is not that complicated after all. When you’ve never fired a gun, you have no way of knowing what to do if for some reason you needed to interact with one. You hear stories on the news of kids being killed while playing with guns, and may assume that firearms are inherently evil and dangerous devices, and you have your doubts about whether the benefits of having one in the home or carrying one in public outweigh the risks. You have no filter through which to verify that the technical information being given to you by the media is true. However, if the mystery of how they work and what they do is removed, you may find that your thoughts about them shift dramatically. So I’ve offered to educate you, and I’m glad to do it! Study these rules carefully. There will be a quiz before we begin. I’m serious. Lots of people are shot with guns that they or someone nearby assumed was unloaded. 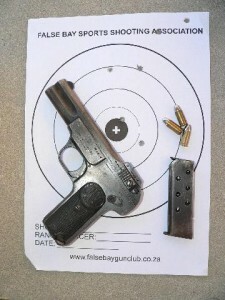 If you are handed a weapon and do not intend to immediately fire it, check to make sure that the chamber is clear and there is no round in the magazine ready to be loaded. Check it again before you hand it back. If you are aware that it is loaded, announce “It’s loaded” before it changes hands, even if you feel silly. I will show you how to do this for any weapon you will be handling before we start shooting. Keep your finger off the trigger until you are ready to fire! KEEP YOUR FINGER OFF THE TRIGGER UNTIL YOU ARE READY TO FIRE! This is the rule that is broken most often when I take people to the range for the first time, especially when they have built-in bad habits from years of unsafe gun handling, or playing with toy guns. 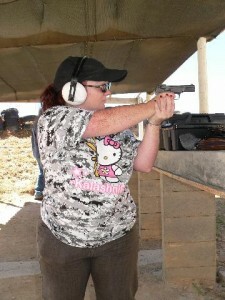 I will show you before I let you handle a weapon how to hold it with your finger straight and out of the trigger guard. If I see your finger anywhere in the trigger guard and you are not in the process of firing the weapon, I will correct you. At the range we’ll be attending, it is OK to shoot at a paper target with a hill behind it. It is NOT OK to shoot at a leaf sitting near the top of the hill. It is NOT OK to shoot at something on the ground between you and the railroad ties in front of the targets. It is NOT OK to shoot at the trash cans or the signs. The beauty of the four rules is that if you become distracted and break one of them but follow the others, an accident may result, but the risk to life is minimized. For example, here is what happened while a DEA agent was giving a demonstration to schoolkids and didn’t think about safety. Nobody dies, and though he was injured, it is not graphic and he made a full recovery. Click the play button below. So what went wrong here? First, at :18, our hero goes off camera and says, “This is an unloaded gun. This is an empty weapon.” You’ll notice that he doesn’t CHECK to see that it is empty. The slide on the pistol is locked back, which indicates that the chamber is clear, but what he does not notice is that there is still a loaded magazine in the pistol! When, with great dramatic flair, he presses down on the lever that releases the slide from a locked state, the slide springs forward, grabbing a round from the top of the magazine and inserting it into the chamber. This is not a malfunction, but the intentional design of the weapon! When his point has been made, he habitually points the pistol downward. This is a good thing, as he’s at least marginally following Rule Two. (Have you forgotten what it is already? Go back and re-read it.) The problem is, he’s focused so much on talking to the kids that he doesn’t take care not to let the weapon point at his own leg. Had he completely ignored Rule Two instead of simply marginalizing it, he could have accidentally shot a child. Next he pulls the trigger. Now, he’s doing this because the design of that particular pistol dictates that in order to disassemble the weapon for cleaning, it cannot be in a “cocked” state, so pulling the trigger (with an empty chamber!) allows the gun to “dry-fire” and places it in a state where it can be disassembled. Force of habit is a powerful thing, but there was no valid reason for him to pull the trigger in this environment. Rule Three! Keep your finger off the trigger until you are ready to fire! “I’m the only one in this room professional enough, that I know of, to carry this Glock Forty. I’m the only-” BANG! Talk about shooting yourself in the foot! By the way, for a “professional”, he could at least get his terminology straight, What he is holding is either a Glock model 22 or 23 that is designed to shoot a “forty-caliber” round. There is no such thing as a “Glock Forty”. Also, you’ll notice that he says to another adult in the room “I just had an AD.” He’s referring to an accidental discharge, but that’s not what happened. An accidental discharge is when a poorly-maintained gun has a malfunction that causes it to fire when the trigger is not being pulled. He had a negligent discharge, or ND, because he fired the gun negligently. All those stories you hear about police officers shooting themselves in the leg in the bathroom at a diner? Same story, only then it was probably a finger mistakenly placed inside the trigger guard, and then being forced down on the trigger when the officer attempted to holster his weapon. Only when we become complacent about safety do “accidents happen”. You will wear eye and ear protection at all times while a gun is being fired. I will always look behind me to check for “ears” being on, and I suggest you do the same. My hearing is not good for a man my age, but I wish to protect what is there. I will become very grumpy if you discharge a weapon unexpectedly and I am not wearing ear protection. We will be shooting at a public, unsupervised range. 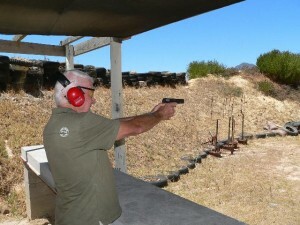 This means that there is a slim possibility that we will interact with other people during our time at the range. 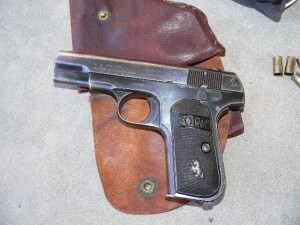 If we are approached and you are holding a weapon, you will hand it to me in a safe manner, and let me do the talking. If you are asked a question directly, answer directly and honestly. Humility and respectfulness are the words of the day for both of us when interacting with strangers on a firing range. Blue jeans work best for the range, since you may have occasion to kneel on the ground to pick something up or while reloading. Khaki’s are OK too, as long as you do not mind either getting a little dirt on them or kneeling on the hard concrete in thin pants. I do not recommend shorts at the shooting range because they do not provide any protection against debris and are very uncomfortable to kneel in. I usually wear a t-shirt to the range. I do not recommend a shirt with a collar because the hot brass shells that are ejected when you fire a semi-automatic pistol fly in an arc, and in some cases a collar acts as the perfect method of catching that hot brass, sending it down your shirt and inducing a dance not unlike that which a bee would cause. Holding a loaded gun while contorting and jumping around frantically is obviously not good. Also, for this and lots of other reasons, if you have more than one X chromosome, I highly recommend leaving your low-cut blouse at home and wearing something more modest! Bring a hat. If one is not wearing a hat, the hot ejected brass can be caught between the side of one’s head and the inside of one’s safety glasses. Ask me how I know. A baseball cap is better than nothing, but you get extra brownie points for bringing a boonie or cowboy hat. By the way: If you should happen to get stung by a bee, hit by a piece of debris, have a hot casing go down your shirt, or any other minor mishap, simply dropping a firearm is better than waving it around, or worse, fumbling with a loaded gun for fear of losing your grip. I can clean, replace, or repair the gun. It is more difficult to replace or repair you. If the gun starts to leave your hands, LET IT DROP. Do not grab at a falling gun! Bring a cold drink, especially if it’s hot outside. When the session is over and you get back into the car, you’ll be glad you did. I usually have bottled water in the car. It’s not refrigerated, but you’re welcome to it. We can also swing by a stop-and-rob store to pick something up on the way to or from. I will provide all ammunition, eye/ear protection, and targets. I am glad to do so, as I consider this a ministry of sorts to those who have never experienced this sort of thing. I do not desire reimbursement for expenses incurred at our first range trip. If you wish to repay me for our first trip, you can do so by telling our mutual friends about your experience and letting them know that the offer is open to them as well. If you have questions, you know where to find me!